Received February 18 2011; revised March 21 2011; accepted March 28 2011.
scribed in our previous publ ication . bosis Haemostasis (GTH), Nuremberg, Febru ar y 2010. Centre at the University of Debrecen..
deep ischaemic ulcer at the same place (Figure 1 (c)). first ABMSCT, D: 6 months after second ABMSCT. ing ulcer healed and rest pain disappeared (Figure 2 (b)). the symptoms in the limb improved significantly. first ABMSCT, (d) 6 months after second ABMSCT. 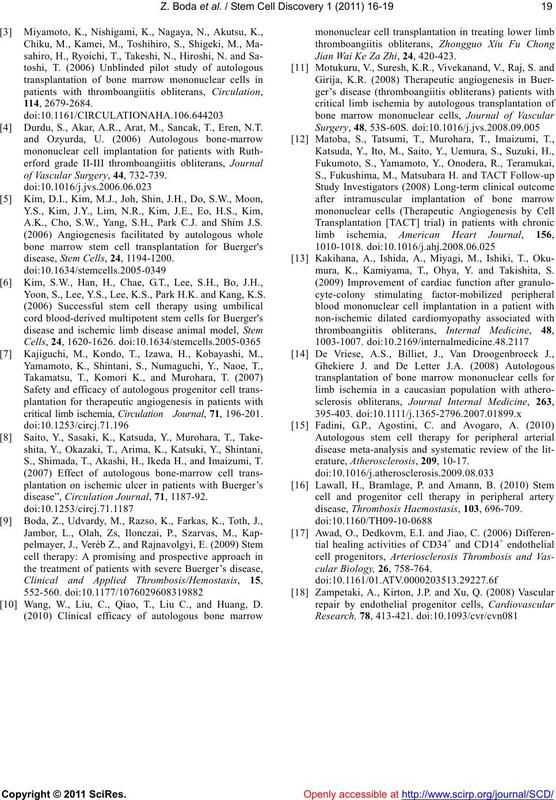 populations and protocols used for the therapy [1-16]. protect the leg from amputation. 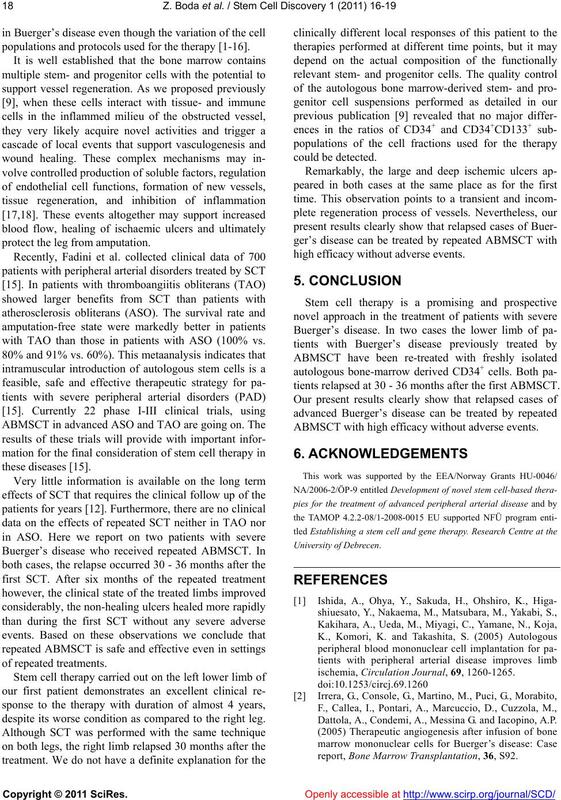 with TAO than those in patients with ASO (100% vs.
despite its worse condition as compared to the right leg. high efficacy without adverse events. tients relapsed at 30 - 36 months after the first ABMSCT. ABMSCT with high efficacy without adverse events. ischemia, Circulation Journal, 69, 1260-1265. Dattola, A., Condemi, A., Messina G. and Iacopino, A.P. report, Bone Marrow Transplantation, 36, S92. Durdu, S., Akar, A.R., Arat, M., Sancak, T., Eren, N.T. of Vascular Surgery, 44, 732-739. A.K., Cho, S.W., Yang, S.H., Park C.J. and Shim J.S. disease, St em Cel ls, 24, 1194-1200. Yoon, S., Lee, Y.S., Lee, K.S., Park H.K. and Kang, K.S. critical limb ischemia, Circulation Journal, 71, 196-201. S., Shimada, T., Akashi, H., Ikeda H., and Imaizumi, T.
disease”, Circulation Journal, 71, 1187-92. Wang, W., Liu, C., Qiao, T., Liu C., and Huang, D.
Jian Wai Ke Za Zhi, 24, 420-423.
mura, K., Kamiyama, T., Ohya, Y. and Takishita, S.
erature, A the roscl eros is, 209, 10-17.
disease, Thrombosis Haemostasis, 103, 696-709.